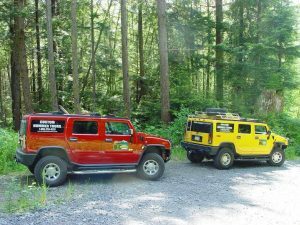 At Alaska Hummer Adventures in Ketchikan, Alaska, the knowledgeable guides offer a one of a kind opportunity that will take you and your party on a private tour of all our island has to offer in a beautiful and rugged Hummer H2 vehicle. This completely customizable tour allows you and your party the chance to choose what interests you most and then pairs you with a local knowledgeable guide. Your journey begins from the moment your guide greets you in Ketchikan, Alaska! Whether it be at the ramp of your cruise ship, your gate at the airport, the lobby of your hotel or any place of convenience for you. At AK Hummer Tours we understand that your time in Ketchikan is valuable. AK Hummer Tours will maximize your adventure! By customizing your tour you can choose stops that can include Saxman Native Village, a rain forest and beach walk, a stop at Herring Cove to look for wildlife in season and a viewing of Beaver Falls waterfall. Stops at the south end of town can include Totem Bight State Park or a bit of off-road traveling that will take you up Slide Mountain to a private vista view point. Into Hiking? We have two terrific trails that we can help you explore; Lunch Creek trail and Ward Creek Trail. Custom stops can include but are not limited to; shopping, dining or exploring just about anything on the island.